I gave myself the last handful of days off from blogging as I wrapped up my time in Australia and prepared for the Te Araroa in New Zealand. I had a few people message me about missing the blog entries, but it was pretty glorious on my end to get a break from that nightly duty! Don’t get me wrong, I absolutely love having the journal after my trip is over, but it is quite the taxing commitment to do it so consistently for such an extended period of time. Over the last 4.5 months, I’ve blogged 108 days (most of them hiking days) with a few breaks between hikes every so often. Since the end of June, I’ve hiked 8 different trails and 1,427mi (less than you’d think due to the low mileage of all the high routes). This transition from Australia to New Zealand pretty much marks the halfway point in my planned 9-plus months of hiking. In my next post, I’ll talk more about New Zealand and what lies ahead on the Te Araroa. Here’s the wrap-up of the last five days in Australia. I had a four-hour bus ride back to the Perth area from the end of the Cape to Cape Track in Dunsborough. Catherine, who I met before the Bibbulmun, was able to pick me up and we spent a day in Freemantle and Perth before I returned to my nearby home base at Marcus and Nicole’s house. Since I hadn’t had any seafood while in Australia, we went to Clancy’s right on the ocean and got the variety platter. I was good and tasted everything, but that doesn’t mean I had to like it! I pretty much stuck to the fish and chips and let Catherine have the more eccentric stuff. THANK YOU Catherine for being so supportive and for being a good friend for me in a country far away from home. After that, we walked in Kings Park and I got to get a good view of Perth, the capital of Western Australia and the second most isolated major city in the world (Honolulu is more isolated). I’m a fan of Perth and really loved my experiences in Western Australia. 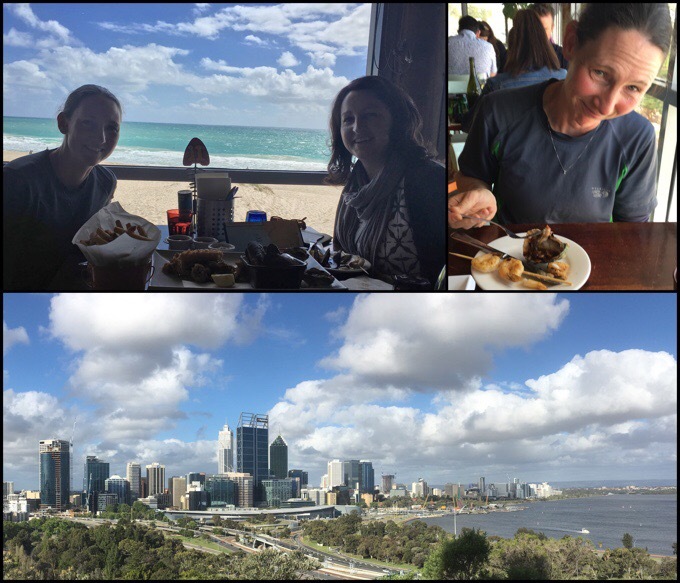 Seafood with Catherine, trying something slimy, and a great view of Perth from Kings Park. From there, I had two full days a Marcus and Nicole’s to plan for the Te Araroa and get caught up on things. I returned home to a steak dinner and the most comfortable bed ever for three wonderful nights. I’m bummed I didn’t think to take a photo while I was there this time around, but I did before the Bibbulmun if anyone needs a reminder. The days there were much-needed as I had totally procrastinated planning for the Te Araroa, and despite having the classically slow Australia internet, I was still able to get just about everything together for the TA (more on that next post). THANK YOU SO MUCH to Marcus and Nicole for giving me a place to call home in Western Australia and for being pretty darn cool people. The three of us could stay up late eating chocolate and watching trashy television for eternity! 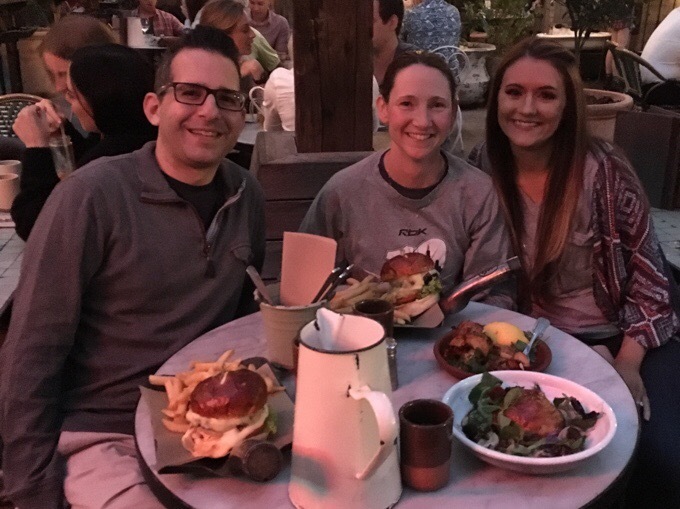 The two days I had for planning, I was able to get out for dinner and meet some people I’d met through the blog that live in Perth. One night, I had dinner with Anna who reached out and also follows the blogs of many of my friends. She will surely walk the PCT one day once her daughter is older, but for now finds shorter hikes and adventures to feed that wanderlust. She keeps a blog at www.fromperthtoperu.wordpress.com titled Travels with an Australian, a Peruvian, and Baby A. The next night, I was able to meet up with fellow thru-hikers Snakebite (PCT 2015, Bib, and CDT sections) and Turtle (Bib 2016). It was fun to be with fellow Bibbulmun hikers and talk trail with thru-hikers. 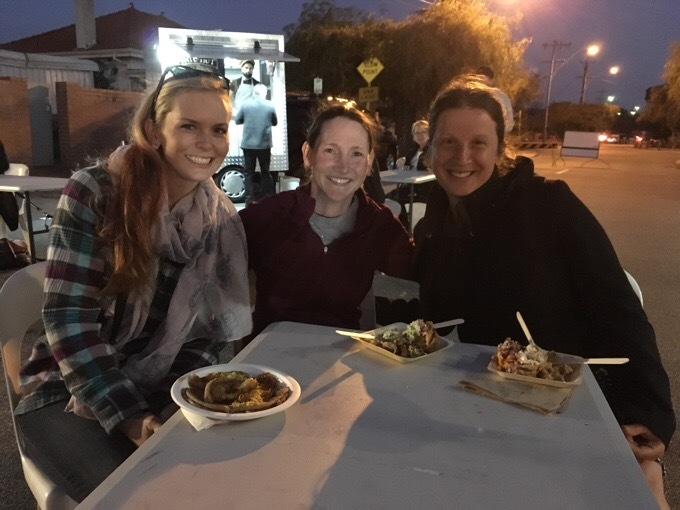 We got to go to the Monday night market in Ingelwood and it so reminded me of all the food carts back home in Portland. It’s a great event with such a wide variety of food. Highly recommend it. Both Snakebite and Turtle were a couple of weeks ahead of me on the Bib. Turtle was key to my planning well before the hike as she was planning her own hike and pretty much served this hike out on a platter for me. Anyone that knows me knows how much I detest the planning process, so this was huge and such a relief. Also, seeing their posts and getting their tips from what they were experiencing just ahead of me was really reassuring. Such a great community in the hiking world! THANK YOU Snakebite and Turtle! After my planning days, I had a five-hour flight to Sydney (on my layover to Auckland, NZ) and jumped ahead three hours. I did allow myself to catch up on Survivor and Grey’s Anatomy on the plane. I greatly enjoyed that luxury. I purposely booked a flight with a 23hr layover in Sydney so that I could get a day to play tourist there. Flight from Perth to Auckland, via Sydney. The Te Araroa begins at Cape Reinga on the North Island. I arrived in Sydney at dinnertime, and was picked up by my cousin Aaron and his wife Jamie, who live in Sydney. We went out to eat and it was great to be with family. We planned out the most optimal way to spend my time before my flight the next day and headed back to their place. Dinner with Aaron and Jamie. 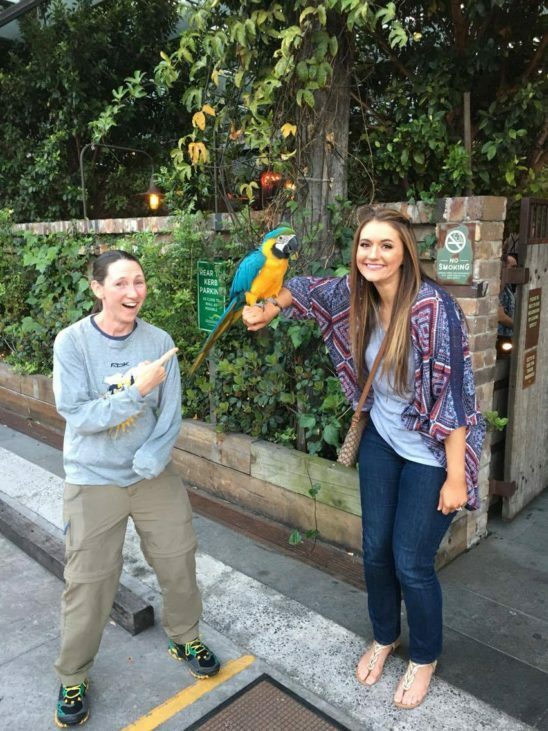 The restaurant had a parrot that anyone could just walk up and hold. I’m not brave enough for those claws. The next morning, Aaron dropped me off at the train station at 6am so I could head downtown on my own to walk to Circular Quay, the harbour between the iconic Opera House and Sydney Harbour Bridge. It was a gorgeous day out and I loved walking without a pack. 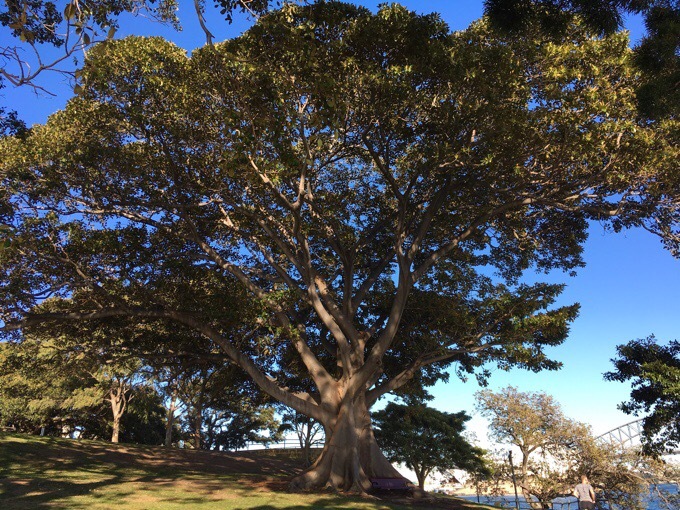 I continued my walk on through the Royal Botanic Gardens that is also right along the bay there. It was great! There were plenty of people out running, kayaking, and even swimming in a pool that was right up against the bay. 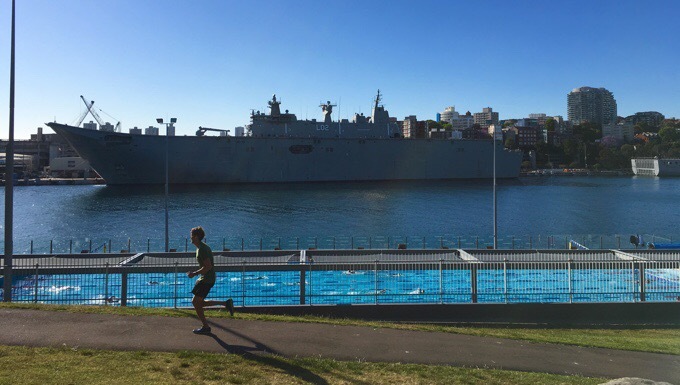 Notice the huge naval ships that were also there. The part of the Royal Botanic Gardens that I walked through was quite nice. I walked around to a peninsula called Mrs Macquarie’s Chair. 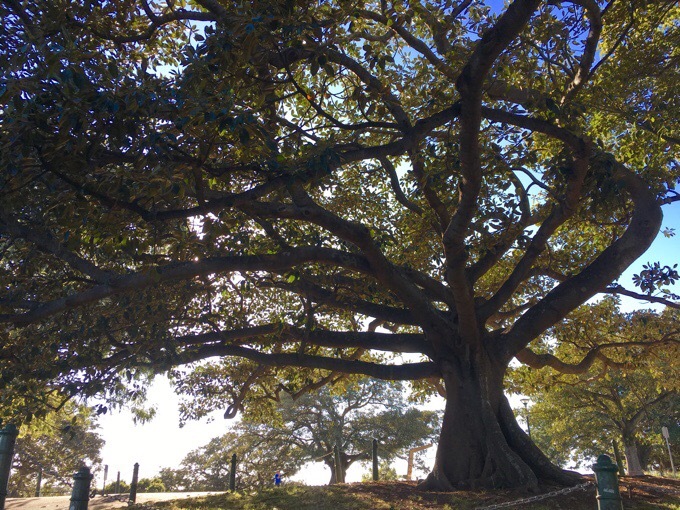 The gardens were spacious with grand trees called Moreton Bay Fig Trees. I couldn’t stop taking photos of them! The second half of the morning, I took the train and a bus over to Bondi Beach. 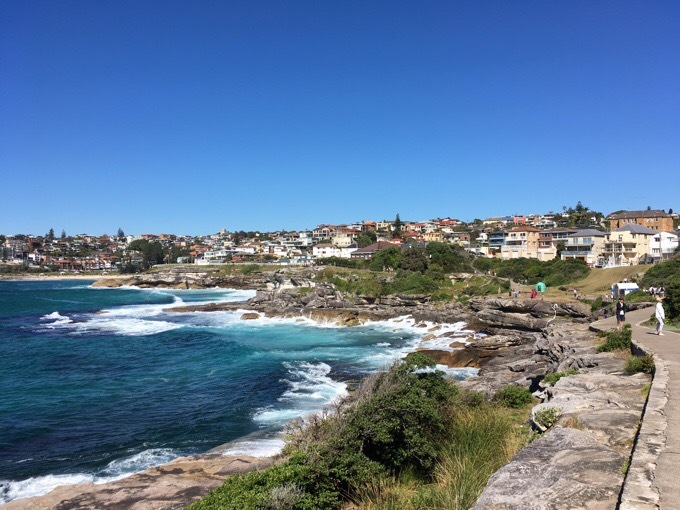 There is a beautiful coastal walking path that goes from Bondi Beach to other beaches for quite a while on the shore there. 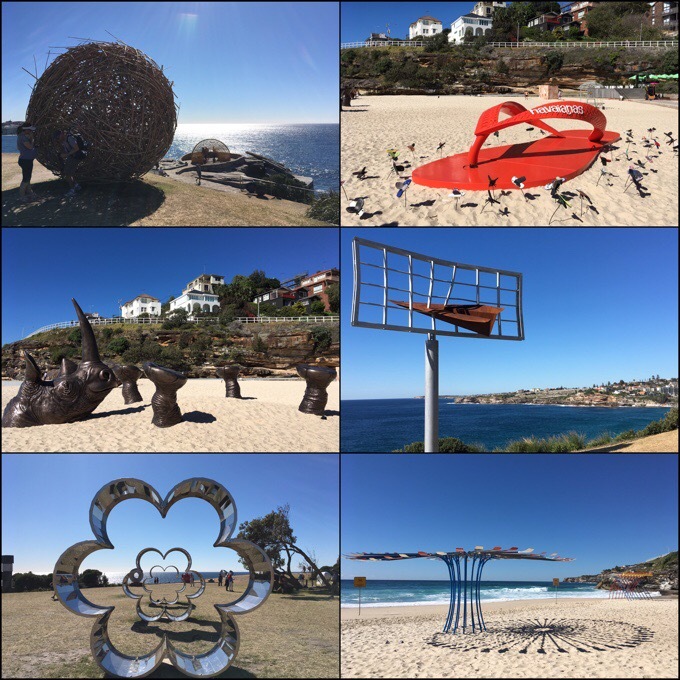 I was super fortunate because there was also a special event going on called Sculpture by the Sea. It really doesn’t get much better than this. Walking along the coast, seeing great views, walking on beaches, and also seeing really cool sculptures that were on public display. I had limited time and was able to walk the first section where most of the sculptures are. It was really entertaining. 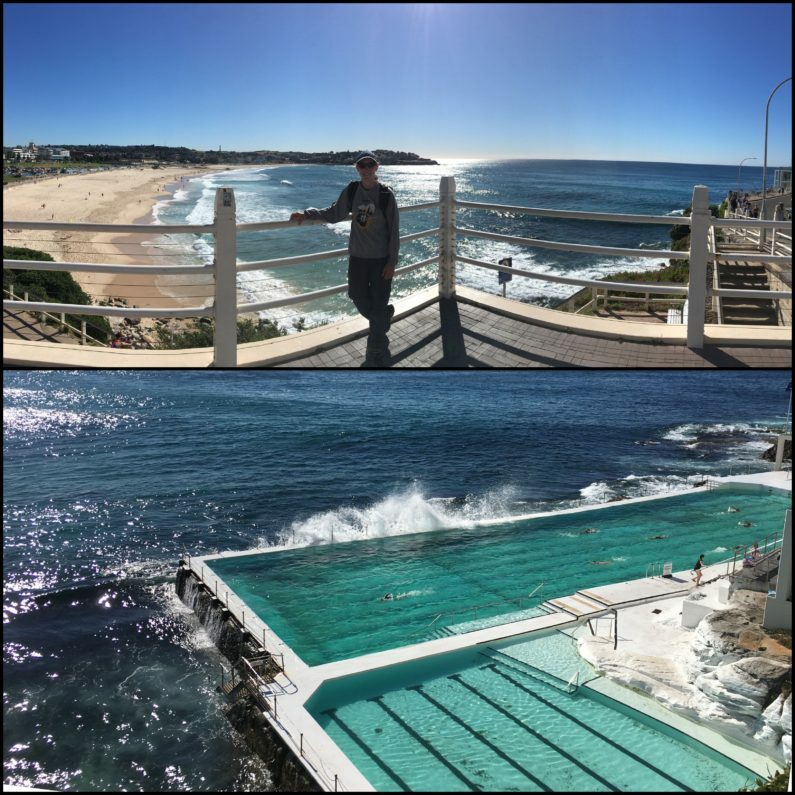 Bondi Beach and the cool Bondi Icebergs swimming pool with waves crashing on it. Aaron and Jamie picked me up along my walk and we headed to the Featherdale Wildlife Park. Sydney has a pretty cool zoo experience and I was torn as to whether I should do that or Featherdale. Well, Featherdale worked out better with our timing to get me to the airport and I’m so glad we did this one! It’s much more intimate and you can even touch many of the animals. I also liked it because it focused mainly on animals that are unique to Australia. No giraffes or hippos here. I’m not big on animals really, and this was the best experience I’ve had at any type of zoo or wildlife park. 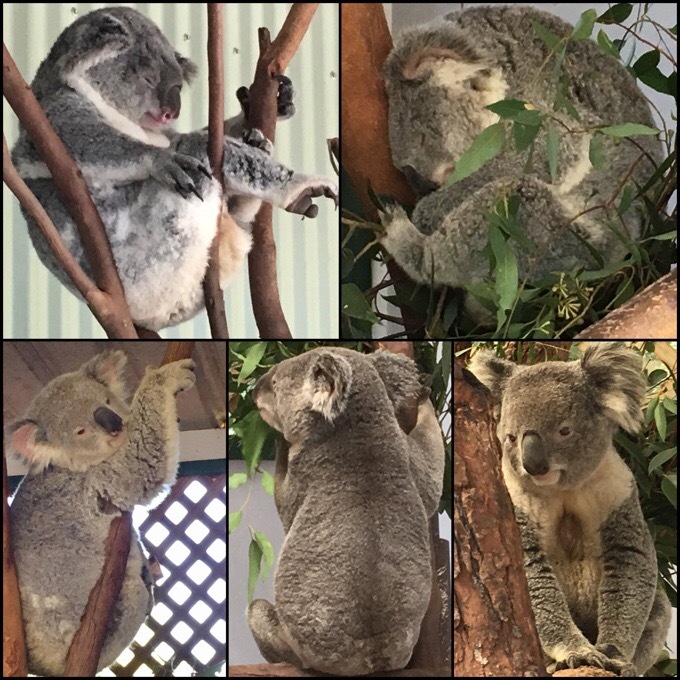 Check it out, koalas! 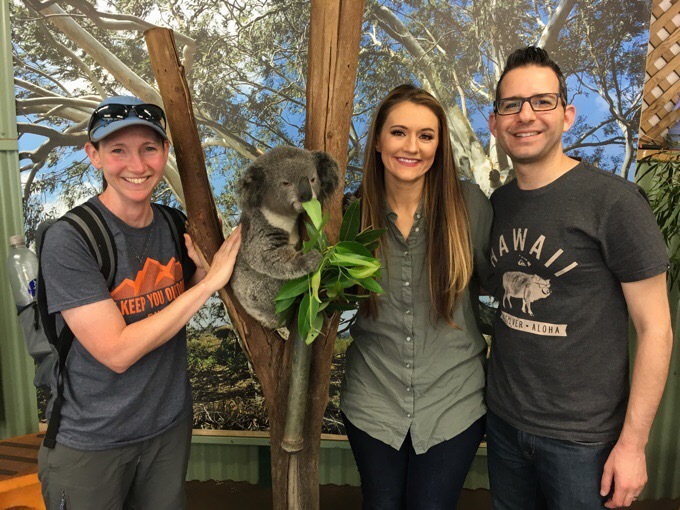 The koala wasn’t as soft as he looks. More like a shag carpet. They totally look like teddy bears! Lots of sleeping since they are nocturnal. 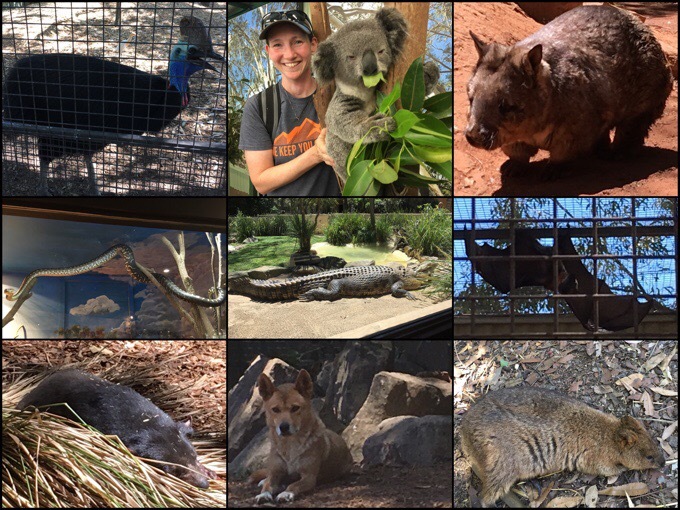 Clockwise: Cassowary, koala, wombat, flying fox, quokka, dingo, Tasmanian devil, snake, crocodile. We seem to have been super lucky with some lively and entertaining action. You know how many times animals can be sleeping or lounging. Well, for many of the ones we saw, they were quite mobile and entertaining. the highlight had to be the echidna, which I was bummed to not see on my hikes. That little thing just wadded around and this one was super funny. He kept walking up to the walk and slowly walking up it and then leaning his head back and extending his arms so he fell back on his back and was stuck for a bit till it rolled back over. We saw him do it four times and it was hilarious! 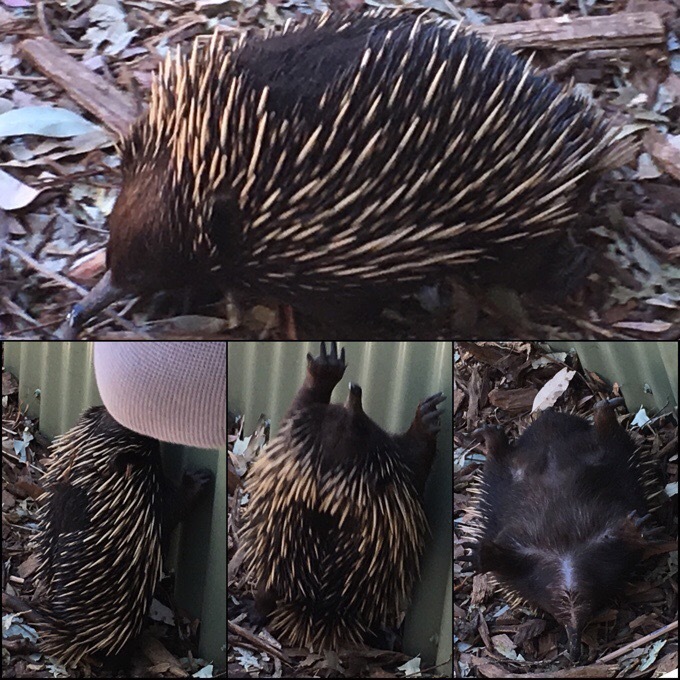 The entertaining echidna falling backwards. Someone’s arm got in the way on one of the shots. From Featherdale, I got on my flight to NZ that left at 5pm and would arrive in Auckland at 10:30pm, another two hours ahead of Sydney and five hours ahead of my internal Perth time. 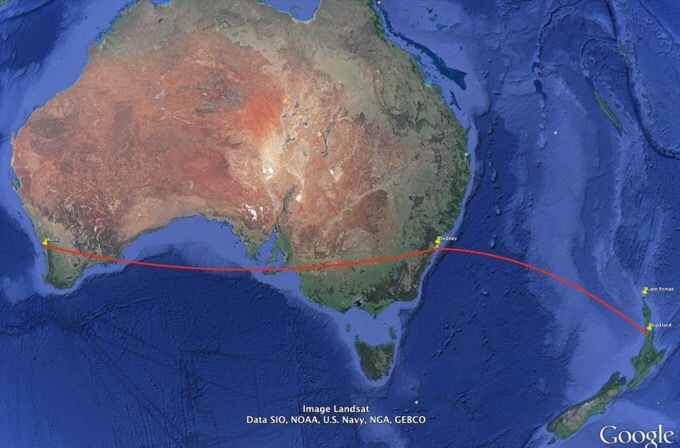 That is where I’ll pick up with the next post as I enter NZ. This is a farewell to Australia for now. I hope to return at the end of the Te Araroa to do Tasmania (the island on Australia’s south end). This trip to Australia was just meant to be a filler between my US hikes and my NZ hikes. I didn’t expect it to really stand out much. Man, was I wrong! I absolutely loved it in Australia and there are tons more hikes and sights still to be explored, so I’m sure I’ll be back. I’ll be back Australia! My favourite view of Perth is from Kings Park! Loved following you on the Bibb and the C2C, looking forward to reading about your adventures in NZ. Good luck! So glad you,got to Kings Pk -my favorite hike in the city place ! 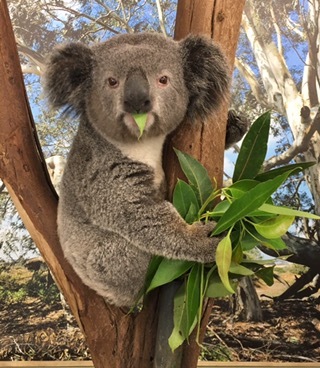 That koala looks so ” unreal “-brilliant photos ! Best wishes for New Zealand -you’re there and I’m in Bali ,about to set out on a short rice paddy hike ! Thanks for the post -I appreciate the dedication and commitment it takes to keep them up ! 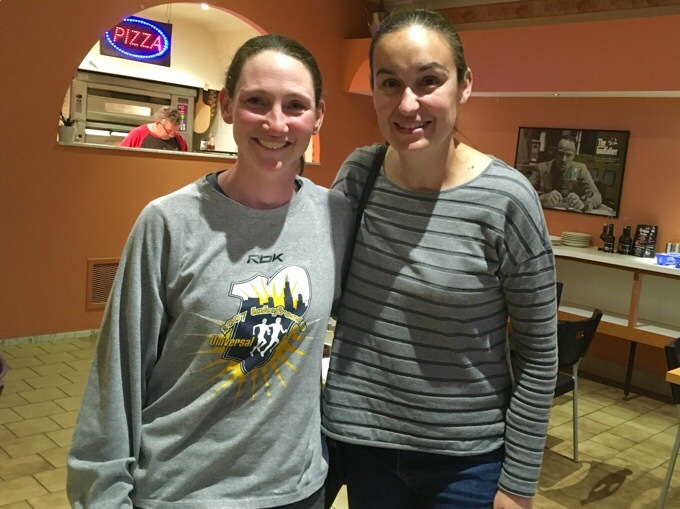 I’m so glad you were able to stop in Sydney – it was great to meet you! If you’re ever back in town, we’d be happy to have you again. Safe travels and best wishes on your upcoming adventures in NZ! So fun to hang out with you two! Whatever dog you get some day, it better like to be pet, hahaha! Erin, Wow! what an amazing trip. The flora and fauna were like nothing I have seen before. My prior idea of what Australia looked like came from Mad Max movies! I still think the idea of koala bear bear cans would be a cute idea. Good to “see” you blogging again! I’m sure you enjoyed te blogging break. I’m glad you enjoyed Your time in syd, it looks like you packed a lot in your short time. Was so good to see you, thanks for a lovely evening. I can’t wait to continue following you on the TA! Best of luck! I’ll sign off as “Anna perth” too as we discussed! Lol ? Hahaha, a good 4+ months of entertainment is on the way! You packed a lot in your shirt break! Love those trees and the animals, too. When you take a couple of days off blog, I know you will return to pick up the trail..
Glad it’s all going so well! Love the pictures. Just in case you haven’t heard… CUBS WON THE WORLD SERIES!! Read the next post Paula. You’ll love it!